There is no such thing as the perfect Whole30. We know that, and we hope you know that too. (If you’ve been trying to do the perfect Whole30, pause on this article and read the link in the first sentence. We’ll wait.) We encourage you to follow the rules 100%, no slips, no cheats, and no excuses. * We’re pretty demanding on the rules. But sometimes, there’s so much focus put on getting it “right” that the line between official rules and our general recommendations get a bit blurry. In this post, we’ll address the most commonly confused rules and recommendations related to the Whole30 program, so you’ll know exactly what to focus on with 100% dedication, and where you’ll need to use your own best judgment. *Want to know why it’s no cheats, no slips, no excuses? Pre-order our new book, The Whole30: The 30-Day Guide to Total Health and Food Freedom, and we’ll send you a video of Whole30 co-creator Melissa Hartwig explaining in her own words! Details on the blog Wednesday, so stay tuned. These are the parts of the Whole30 program that apply to every participant, always. * These rules are your port in the storm, and the place to turn to when what you see on Pinterest or hear from your fitness trainer leaves you feeling confused. Our Whole30 Program Rules are always your best source for what is (and isn’t) allowed on the Whole30. These rules are written in stone, and non-negotiable. * Yes, all of them. 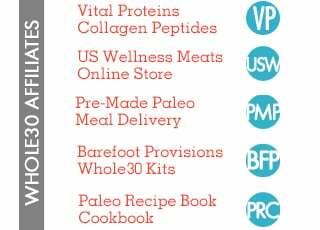 They are the pillars of the Whole30 program, specifically designed to help you achieve the life-changing results you’ve been reading about. Yes, we know that sometimes they seem really, really specific.  But trust us: the specificity of the program is what makes it so effective. See the official rules for a more detailed explanation of the foods and beverages that fall under each category, and any exceptions we might make. *Unless your health care provider tells you otherwise. Your provider’s instructions always trump Whole30 rules, and we encourage you to speak with him or her before taking on our healthy lifestyle program. We’ve discussed this extensively in It Starts With Food, on the website, and in a special chapter in our new book, The Whole30. While this rule isn’t as black-and-white as the other foods we list as off-limits (see the “a little of both” section for more details), there are some items we specifically call out as off-limits, whether you think you have an issue with these foods or not. And this one recipe where eggs, date paste, and coconut milk are combined with prayers to create a thick, creamy concoction that can once again transform your undrinkable black coffee into sweet, dreamy caffeine. One of the least popular (and most often ignored) rules of our program says that you stay off the scale for the full 30 days. Completely off. As in, don’t weigh yourself, or take measurements. This is not a suggestion, this is one of the official Whole30 program rules. Why? Because we think there’s more to your health than the number registering on the $20 hunk of plastic you bought at the local value store. And because very few people have a healthy relationship with the scale (and if you’re having trouble with this rule, that tells us that you don’t). So for 30 days, we want you to focus on the changes in your health, in your mood, and in your relationship with food rather than how much you weigh. The following are not official rules of the Whole30 program. If you snack, buy non-organic eggs, or eat six servings of fruit in a day, that has no bearing on whether you are still staying true to the Whole30. We make these recommendations because we believe they will maximize your results with the program. These practices are the most likely to lead to health and body composition changes, an improved relationship with food, and overall awesomeness. In summary, you are free to eat seven meals a day of Rx Bars and sugar-free bacon with a side of non-organic blueberry/strawberry/banana smoothie and you’d still be doing the Whole30 with 100% compliance. However, we would not recommend this. Our free meal template details our recommendation for building your Whole30 plate, especially when you’re new to the program and your natural regulatory signals (hungry/full) haven’t kicked in yet. We make sure you get enough protein, fat, and veggies while still giving you some flexibility to accommodate those days when you’re not so hungry (or eating All the Things). However, your plate doesn’t have to look like our template, and for many who need to eat way more (big, strong athletes) or way less (smaller kiddos), remember that as long as the ingredients in your meal are 100% compliant, then it’s a Whole30 meal. As we explain in detail in It Starts With Food, eating three meals each day with minimal snacking (except pre- and post-workout meals) helps to keep your hormones in a healthy rhythm and teaches you to focus on eating mindfully. However, it’s really okay if you find you have to eat between meals. For folks who are used to eating six small meals, it might take some time to get used to eating just three big ones. For those who work really long days, you might find that four meals or three meals and a snack are in order. For kids and pregnant/nursing mothers, this recommendation goes right out the window; snack away (just make sure you’re leaving about 3 hours between eating sessions, and not grazing all day). Sometimes, for no apparent reason, you just need a little something to get you through, and that’s okay too. The success of your Whole30 likely isn’t riding on whether or not you have a mini-meal a few afternoons. Our meal template recommends around two servings of fruit per day, eaten with your meals (and not on their own as “dessert” or a snack). However, that’s just a starting point, not a hard and fast mandate. We’re really not concerned with the amount of sugar in whole foods, in the context of a Whole30 diet. It also makes sense to eat more fruit in summer, and less in winter, so your intake in August may look like five servings a day, and just one or two in January. However, if eating fruit awakens your Sugar Dragon or you find yourself using it to satisfy an old sugar craving, we encourage you to take a good, hard look at when, how often, and why you are incorporating fruit (especially dried fruit) into your Whole30. 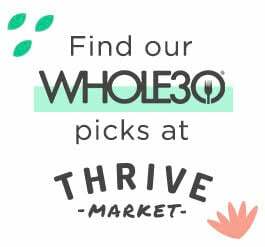 There are a few commercially available dried-fruit-and-nut bars compliant with our Whole30 rules. In the U.S., we’ve got 4 flavors of RxBars and 11 flavors of Larabars; in the U.K. you’ve got a half-dozen or so Nak’d bars that fit the bill. There are also a number of recipes for homemade no-sugar-added “energy bars” (like these from Stupid Easy Paleo). Every time we talk about these fruit-and-nut bars, we say the same thing: “They’re on-the-go emergency food, perfect for long hikes, business travel, or unexpected late nights at the office.” We caution you not to use these as-close-to-candy-as-you-can-get convenience foods in place of real food, but that’s just a very strong recommendation. Overuse these or lean on them too hard when you’re craving sweets and you’ll find yourself on Day 31 with the same roaring Sugar Dragon that led you to us in the first place… but that’s your business. As long as the ingredients are all compliant, you’re still 100% doing the Whole30, no matter how you choose to use these in your program. 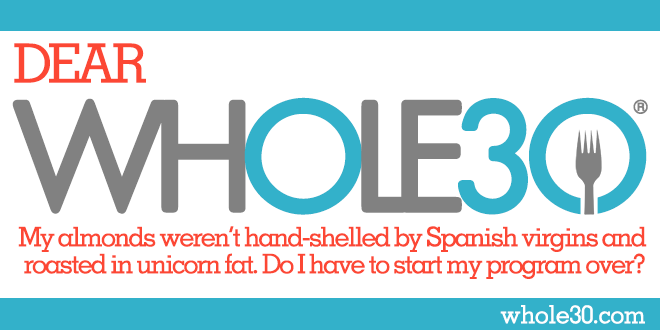 No, you don’t have to buy almonds shelled by Spanish virgins and roasted in unicorn fat to be Whole30 compliant. As we discussed in great detail in It Starts With Food and in our Conscientious Omnivore series, we think that naturally raised and fed animal proteins, organic or pesticide/herbicide-free produce, and organic pantry staples (all locally sourced, where available) are the best choices you can make for your health, the health of the animal, and the health of our planet. However, we understand that those choices are not within everyone’s current financial capacity or geographic availability. Use your grocery dollars as wisely as you can, and make the best choices within your context, knowing that labels like “grass-fed” or “organic” are never part of the Whole30 rules. We’ve covered this ground before, but it bears repeating. There is no official Whole30 ban on smoothies. This is just a recommendation, based on the science and our experience. We outline all of this in It Starts With Food, but we’re happy to go over it again real quick. First, we would much rather see you eat a meal you have to chew instead of drinking your calories, because satiety. Smoothies are usually super heavy on the fruit, which means you’re ingesting way more sugar than you would if you just ate the fruit in its whole form. Also, smoothies don’t usually contain protein, so you’re missing out on both satiety and complete protein, which is really hard to make up in just your two other meals. Plus drinking a huge whackload of fruit first thing in the morning can set you up for more volatile energy, hunger, and cravings throughout your day. But no, we’re not going to kick you out of the Whole30 for having a smoothie. Just maybe have some eggs with it, okay? This is the place where the rules and the recommendations overlap, and a little of each apply. Yes, we’re talking about pancakes again. The recreation of poor food habits using technically compliant ingredients is one of the most controversial (and most difficult to define) parts of our program. It’s one part rules, which we talked about above, but also one part “use your own best judgment.” Context matters, and you’re the only one who knows whether a certain food is okay for your Whole30. For example, the amazing “fried” chicken in Paleo Comfort Foods is a perfectly appropriate dinner choice, but if you’re coming off a wicked addiction to KFC, perhaps this isn’t the best choice for you during your program. Think critically about whether the food choices you are making during your Whole30 fit the spirit and intention of the program, not just the technicality of the rules. Is this food going to trigger unhealthy behaviors or cravings for you? Are you using it to prop up sugar cravings, or to fill the urge to snack mindlessly? Does it violate what you know to be the spirit of the program? The rule of thumb we like to use: when in doubt, leave it out. And remember, it’s only 30 days. In Chapter 9 of It Starts With Food, we discuss all the reasons that seed (vegetable) oils like soybean, peanut, canola, corn, or grapeseed violate our Good Food standards and should be off your everyday plate. However, if we eliminated all vegetable oils from the Whole30 program, you’d never be able to dine outside of your own home! All restaurants use some form of vegetable oil in their cooking. A ban on all oils would mean you could never have a business lunch, grab a compliant burger at the airport, or enjoy a date night at your favorite bistro. And that would make the Whole30 plain old impossible for most of you. The Whole30 program guidelines are very clear: Any off-plan choices during your Whole30 calls for a restart. We’ve even clarified the subject in greater detail for you, giving you several things to consider when determining if a restart is necessary. But we still get the question every day from folks who missed an ingredient on a label, made an off-plan choice, stepped on the scale, or made yourself some pancakes/cookies/muffins/pudding. So do you have to start over? We’d want you to, yes. We understand that no one’s Whole30 is perfect, but we really want you to have 30 full days, start to finish, with 100% compliance to the rules, spirit, and intention of the program. Why? Aside from the potential physiological impacts of your off-plan food choice, because you made a commitment to yourself, and breaking the rules sends the message from you to you that you are not important enough to honor that commitment. This message stinks, and will permeate every area of your life, whether you understand that or not. So, take the time to read that label twice. Ask all the right questions when you go out to eat. Stay off the scale (it’s not worth it), and put away the chia pudding for a month. Give this Whole30 your very best and reap the most reward you possibly can from this month. With few exceptions, you’ll get back as much as you put into it. And if you really don’t want to start over, you don’t have to, because you’re a grown-up and we can’t actually tell you what to do.